Mary and I received an invitation to join the folks at Big Sky in a trip to St. Michaels on Dec. 9th. Everyone will fly into KESN (Easton, MD) and we will have ground transportation ready and waiting. 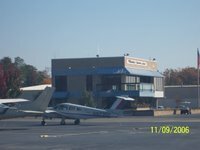 A bit of history, I started my lessons at Big Sky in Millville, NJ but due to work issues and my instructor needing some time off to heal injuries I made the move to TAS at Brandywine Airport. I still am very fortunate that I get to work with the folks at Big Sky at both KMIV and KWWD while managing projects for the Delaware River and Bay Authority. Mary asked one of her girlfriends (Joanne) to join us on our trip. According to past trip accounts they have the shopping plans master ed......Hmmmm...I can't even use the ole weight and balance line since they both will eagerly ship packages home, without missing a beat. We're talking professionals here, these ladies know how to get the shopping done. On to the flight plan. We are scheduling for December 9th to KESN and ground transportation to Christmas in St. Michaels. I think the group is heading over from KMIV around 9am but that will need to be confirmed. I am thinking about getting into Easton around 9am and get secured and ready to roll by the time they start entering the pattern. 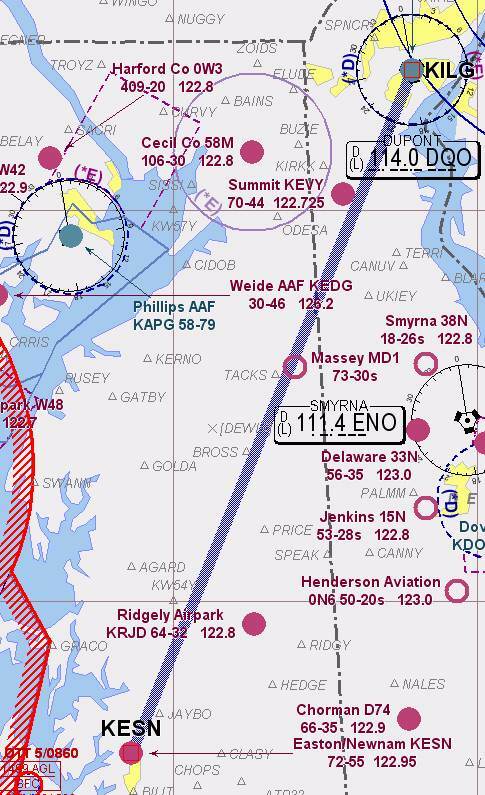 Here is a quick look at the AOPA flight plan. We get close to the St. Michaels air space but nothing to worry about. Of course there is always the ADIZ lurking to the west. Mary and I made arrangements with our friend Susan for a overnight visit to Williamsburg. One must understand that Susan is addicted to work :) and it's hard to match up schedules. The ladies got all the details squared away and I took care of the flight planning. 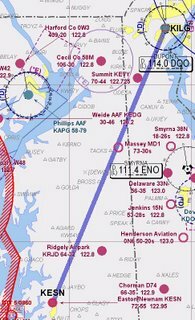 Friday's wx was looking fantastic so the plan was to depart Wilmington (KILG) by 8am and make a breakfast stop at Georgetown (KGED). The stop over was suggested by Mary in order wait out the morning fog at Williamsburg (KJGG) she figured why not stop for eats at one of our favorite places. The METAR for KGED 101354Z AUTO 29003KT 10SM CLR 16/09 A2997 (for the non-pilots, very little wind blowing from the west northwest and you can see 10 miles. Our pre-flight and taxi to run up now complete we hold short of 27 at t/w 'M'ike. With a call to the Wilmington Tower to advise 28679 is ready to go, we get a quick response and get rolling. Wow, what a beautiful morning. We depart 27 and climb straight out, reaching 500' above pattern altitude I turn on course south. 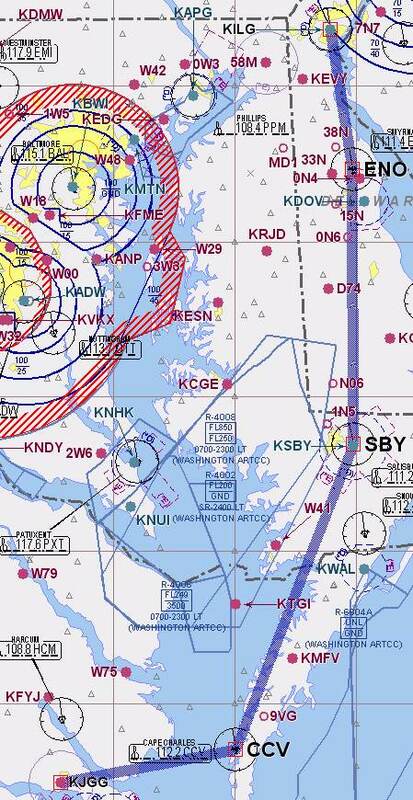 Once leaving class Delta of Wilmington we're cleared to change frequency and contact Philadelphia Approach. 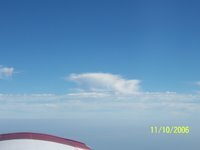 A nice ride along today with Philly at 4500' and a quick hand off to Dover App has us soon descending for Sussex County. Field in sight and now squawking VFR (transponder set to 1200) I announce positi on and request airport advisories (wind direction and speed). Runway 22 for a full stop seems to be the ticket in. No traffic as we approach so, as I am east of the field, I announce a straight in final of 3 miles. A nice smooth landing and taxi to the cafe' for some breakfast has us climbing out of the aircraft and heading for a good seat (at the window of course). All loaded up and ready to head to JGG now that the weather has cleared. I decided to hook up the Lowrance 1000 as a backup to the on board equipment (Garmin 300XL). I am still learning the Garmin. With the SBY VOR (Salisbury Navigation Aid) tuned and ID'ed we are on course and talking to Dover Approach. Dover App, hands us off to Patuxent Approach who in turn eventually hands us over to Norfolk Approach. Mary was taking pictures and noting the leg times (times between each check point) as we stayed on heading. A nice tail wind was showing a ground speed of 130 (149 mph) on the Garmin and the same on the Lowrance. The shot on the left with the ships was taken just north of New Point Comfort, if I remember correctly. 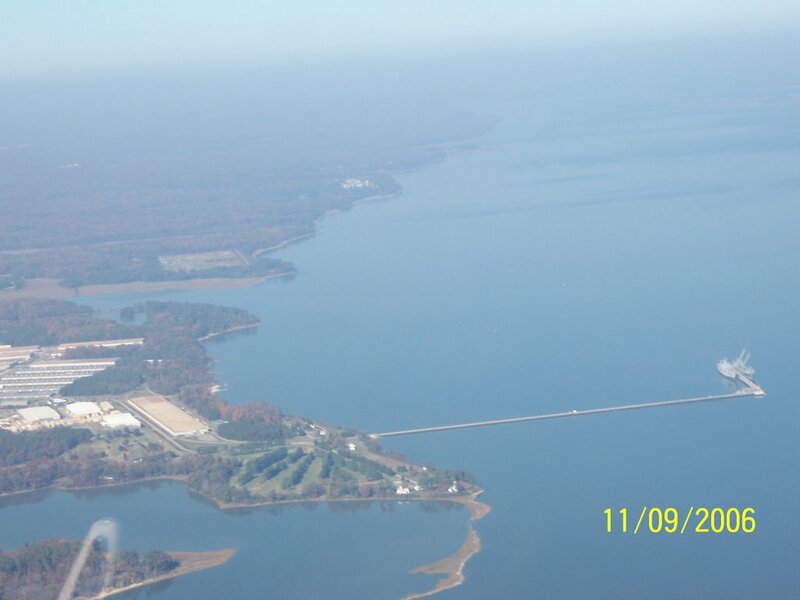 Mary got a great shot of Point Comfort on the way home. Norfolk Approach was really good, great voice easy to copy and just plain on the ball. A few traffic call outs and some nit wit not talking or squawking in this busy area had everyone looking as jets made their way into Newport News. It was busy out there and I got a reminder for Altitude as I drifted a tad above my assigned level by 150' I acknowledged and got back to 4500' while continuing to look for and confirm traffic. 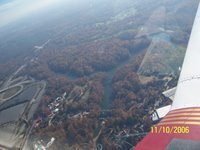 With the notable bend in the James river pointing the way to JGG I was cut loose to descend at my discretion. A flip flop of the radio to 122.8 and a call to JGG to announce my position with a request for airport advisories has me following the river for 31. 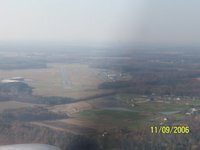 I see and hear no traffic so I opt to pass on the overfly and reposition for downwind 31 and instead with full field and patterns in view announce a 3 mile final for 31. With a steady descent and numbers in sight I add the last notch of flaps, bleed off airspeed, listen to the stall horn moan and gently set down on the mains followed by the delay and light touch of the nose wheel. Mary says nice job, very smooth as we roll out for parking. Unicom comes to life and asks our intentions and I advise we are here for the night and pull up to secure six seven niner in it's designated parking area. We unload and head in to pick up the rental that is waiting and ask for a top off. A few folks are eating at Charley's but we decided to get to Susan's ASAP. We have directions printed out to the hotel and find our way with no problems. The ride was maybe 25 minutes. We arrive at the Hampton Inn, check in completed and secure internet access (for wx briefing and flight plan update) life is good. Mary and I check out our room, I hit the showers since the temps here are a bit warmer then home. I was soaked after securing the plane. We settle in and decide that we should have packed for warmer temps, lessons learned. I reminded Mary that as Bo Boggs once said on the Flights of the Mouse web page, "From this point, if we forgot something, we either do without or buy it when we need it". We decided to "buy it" for a few "lighter" clothes. Well shopping is right up the girls alley so we meet Susan and head out for a quick lunch, key word here is quick. Just across the parking lot from the Hampton is a Pizza Uno Chicago Grill something or other. We are seated and place our orders....insert jeopardy music....Two ice tea's and one glass of water and oh yeah,50 minutes later at the end of my rope I ask for the manager. He finds his way over and I explain (we just get lunch served), the orders are screwed up and my food is lukewarm at best. I explain to the guy there is a problem somewhere either service or the kitchen needs some help but this service stinks. He says he'll comp the meal and it's all his fault. Yeah I think well that's great, fall on the sword another time I only want my food right. It takes everything in me to be nice, but the Bride is proud, I was very well behaved. We finally finished lunch and I asked our waitress for the check. She explains the manager is comping the meal and I explain to her I don't accept free meals, that's not why I complained. I pay the bill and we leave.....grumble grumble...Grrrrr they don't get it. Well the ladies are happy as we hit the shops. I pick up a few light shirts and a brown belt since I forgot mine and I am good to go. Yes, the man gets in and out with mission accomplished, the ladies of course must continue. Hey they had fun and I sat out on a bench in the shadow of the shops and would you believe....right on the corner of the left downwind to base turn in the pattern for PHF r/w 7. I sat and enjoyed the nice breeze judging the dive for the runways vs the nice smooth finals. Just as I am thinking life is grand I hear the rumble of jets, multiple jets. In an instant four military jets in formation roll through the base leg of the pattern and continue east south east, ....A great sight and good for the soul. I "think" they may have been involved with the dedication of a Marine museum in Triangle, VA but I'm not positive. With our shopping fix met we decide to head back and get dressed for the concert at the Ferguson Center. Susan gave us an anniversary gift of tickets to the show to see Gary US Bonds and The Four Tops. Listen to one of their greatest hits..."I Can't Help Myself". We met back at an Irish pub (Keagans)for a very light dinner. Flash fried calamari, crostini's with beef tips, oyster Rockefeller and drinks. I passed on the drinks not knowing what time we were heading out on Saturday, besides I am the designated driver. Off to the show to see Gary US Bonds who did a nice job as the opening act...He really had the place rockin'. Then the Four Tops took the stage.....all the moves, like suits and FANTASTIC music. What hits, what a walk down memory lane, it was really nice. Thanks Susan! After the show we all decided to head out for desert and coffee. We tried a place near the Hampton Inn but they were closed. We decided to call it a night and turn in. Mary and I walked into the smell of fresh brewed coffee in the lobby so she grabbed a cup and filled a cup with hot water for my English tea, she thinks of everything, even packing the tea I like. We also noticed one of the field hockey team coaches hanging out in the lobby area. No doubt on guard in case any of the high school girls try anything, it was a classic moment. Mary putzed around with this and that while I decided to turn on the news to get the weather. I was also connecting to the internet to take a look see for myself. 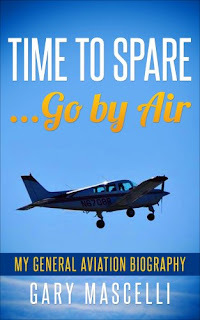 We carried Mary's lap top along but decided that we are going to set my lap top up with an AOPA planning connection and all the links we will need from the road, it's much lighter. The internet is up and running and access to the AOPA planner is good to go. I also checked into the club calendar and that worked too. Finally time to sit back watch some tv and sip on a fresh warm tea. I am beat, so I turn out the lights after channel surfing and pass out. Mary says she wishes she could do the same but I serenaded her with some wood cutting. Yikes, between cutting wood and a bed that was as hard as concrete it's no wonder either of us got much sleep. Ahhh...rise and shine to a new day with beautiful weather. We are tempted to extend our stay but instead follow the wx forecast and decided to head out after breakfast. ILG is reporting IFR but clearing out by 1500Z. 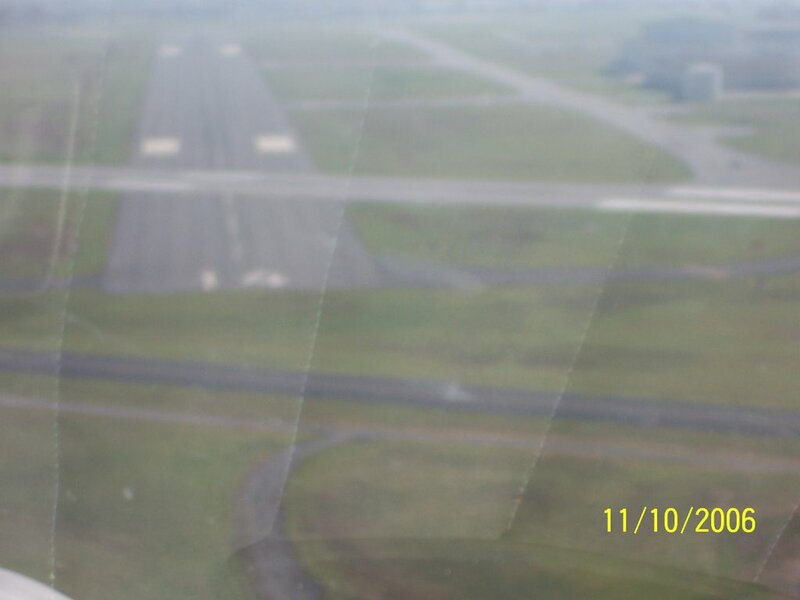 METAR at JGG calls out the following; 111523Z AUTO 14004KT 10SM CLR 21/14 A2998 RMK AO1. We pack up and head down for check out and bump into a few of the field hockey team members. We teased them about the "posted guard" in the lobby last night and mary said someone was having fun in the early morning hours as noted by all the giggles. Checkout was followed by a short drive to the local Cracker Barrel. We meet Susan, file in and get seated rather quickly. Mary went through the shop while I went outside for a sit on the rockers. As for the shopping, the weight and balance is not impacted with 200 plus pounds available between the back seats and baggage. Not that that matters, since I was instructed that whatever can't be brought home with us can be shipped to the house...., she's good...real good. Time for good-byes, which are never easy but we give Susan hugs and let her know we will return in April to see her. We watch Susan pull away in her new town car, I know a piece of my brides heart goes with her. Mary and Susan have been friends for many years (30+) and shared an apartment/condo and a house for a good number of those years. It's a quiet ride to the airport but we both are happy that the first overnighter was indeed to visit one of OUR best friends. We head west on I-64 for the airport and have no problem finding our way to Six Seven Niner. First order of business is to return the rental so we wander into the terminal and BAM! there it is, as promised the smell of fresh baked bread....oh my God it was awesome. I was tempted to grab a loaf and take it for the ride home but the older gentleman baking didn't look like he would give it up easy. With the fuel bill paid (top off 14 gallons - that's 7 gph)we uncovered our baby and loaded up the baggage. While performing the preflight I left a sample of skin from a finger and bled all over the tie down ring. I had to use a handi-wipe to wash it and me off (Thank's to Mary for packing that stuff). A last look back at the terminal with a wave to the gentleman that took care of the counter and we saddle up for home. Winds favoring r/w 13 this morning so I taxi out to run up and then hold short for a cirrus on final. 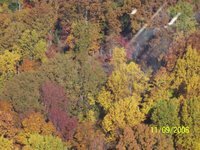 Noise abatement calls for a turn out at 500' to 180 to avoid houses. We depart and turn out then once above pattern and closing in on PHF class Delta I turn to shadow the James River. Confirming squawk code I am on board with Norfolk Approach. 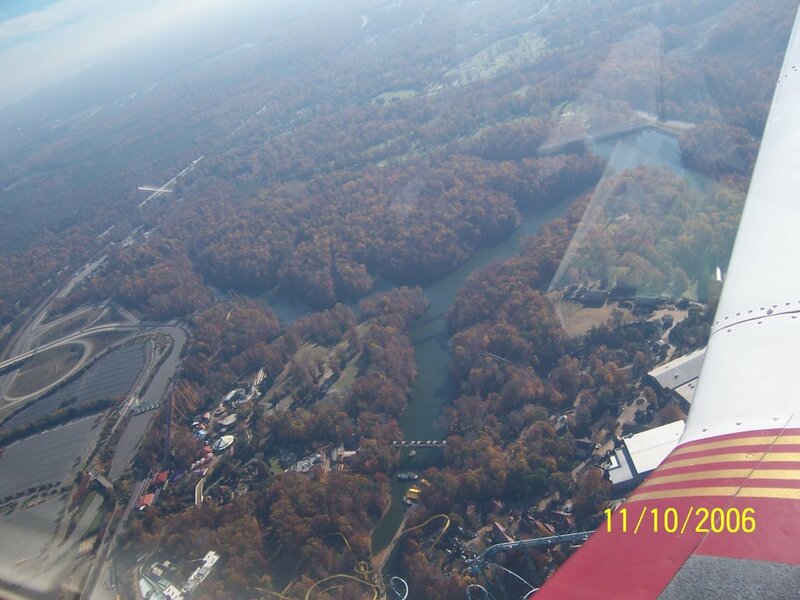 We overfly Busch Gardens and Mary snaps a few shots with the zoom. The view is just gorgeous this morning. This view alone is worth the year of lessons to get here. For the folks who don't fly, you have no clue what you are missing. 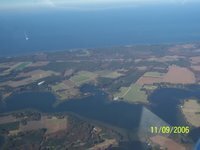 We cross the York River with the York river bridge on our right then cross the Moblack Bay where Mary gets a shot of the New Point Comfort Lighthouse. From the point we turn towards Accomack, KMFV. Norfolk Approach again is very good, great voice, easy to copy and very accomodating. Approach calls and tells us the restricted area 4006 is cold. I thank him but advise we are enroute to Accomack, Salisbury and Dover for the scenic ride home, he acknowledges with a "have a great trip". There are a good many sail boats on the Bay today and the usual shipping traffic. 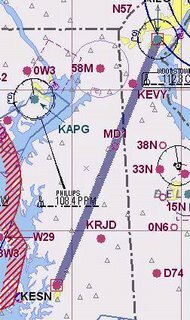 As we cross the shoreline we are given a heads up about an aircraft VFR not talking or squawking at or about our altitude approaching at our 9 o' clock. I quickly turn the head and shoulders to my 9 and search, clipping the wind scoop that flips into the pilot side vent window with my elbow cracking the hinge clean off the bracket. GRrrr....Grumble....same traffic now called out at my 12 o'clock and we report do not have traffic in sight. Mary and I are on high alert with see and avoid but can not see this aircraft. Finally a report of traffic NOT a factor. On past Accomack and heading northward towards home,KILG. The DQO VOR rock solid and a quick peek on each GPS shows our ground speed at 137 Kts or about 160 mph. Not bad, a bit of a tailwind ea ch day, each direction. Mary and I are taking in the sights while maintaining a scan for traffic when she asks what a certain cloud formation looks like. 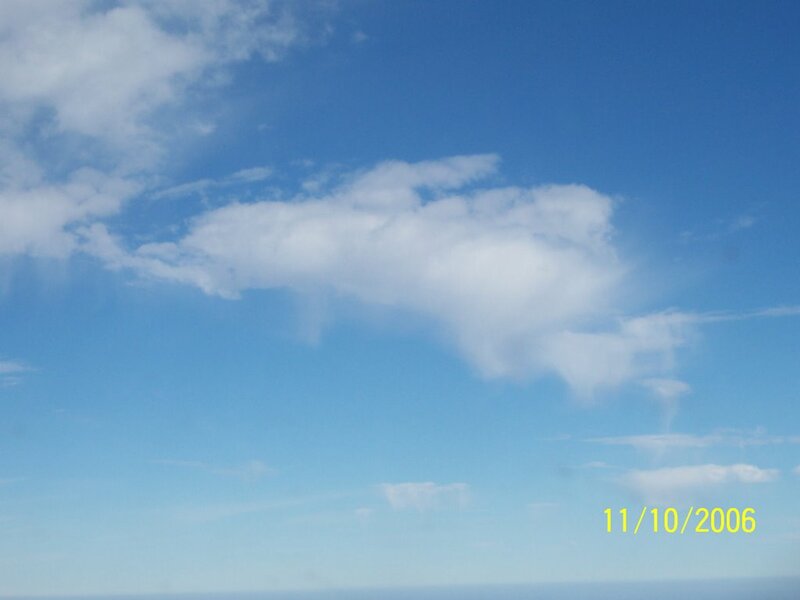 I start to laugh and agree with her that it looks like a rabbit running, no we are not in need of oxygen. Take a look for yourself. Now that we all had our laugh lets look at what we see in the next picture....ok it's easy, it's the Salem nuke plant cooling towers. Ok, this was the easy see and say choice, you all pass. 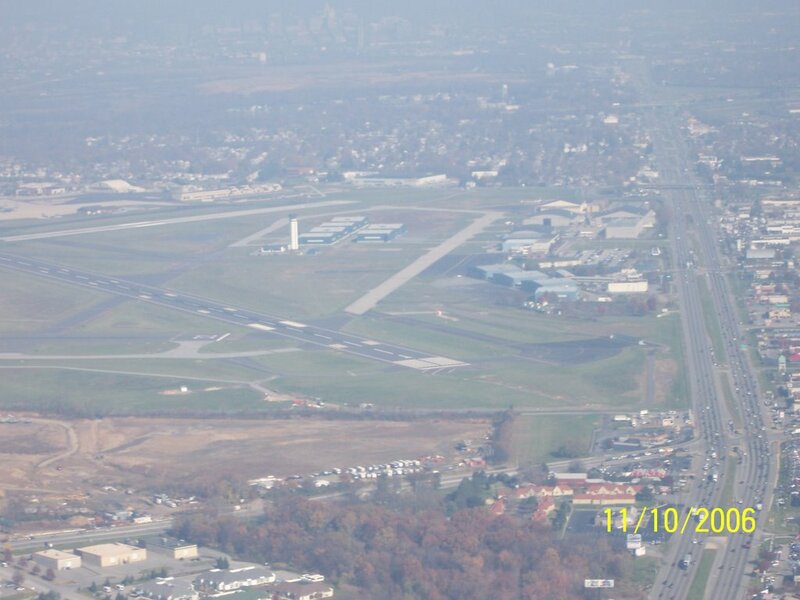 We are less then 20 miles from ILG so when the tower/ground is finished with a clearance we will make contact. 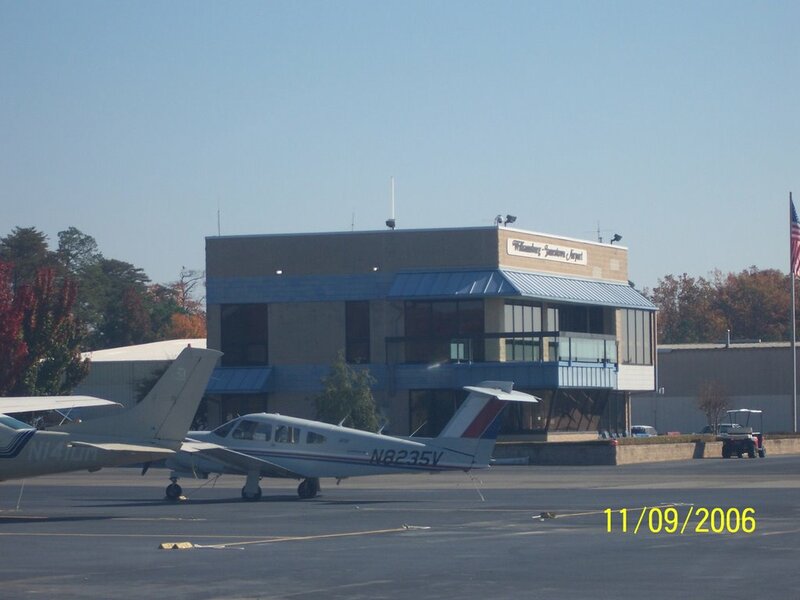 Wilmington Tower, Piper 28679er 15 to the south inbound for full stop with "D"elta 3500 level. 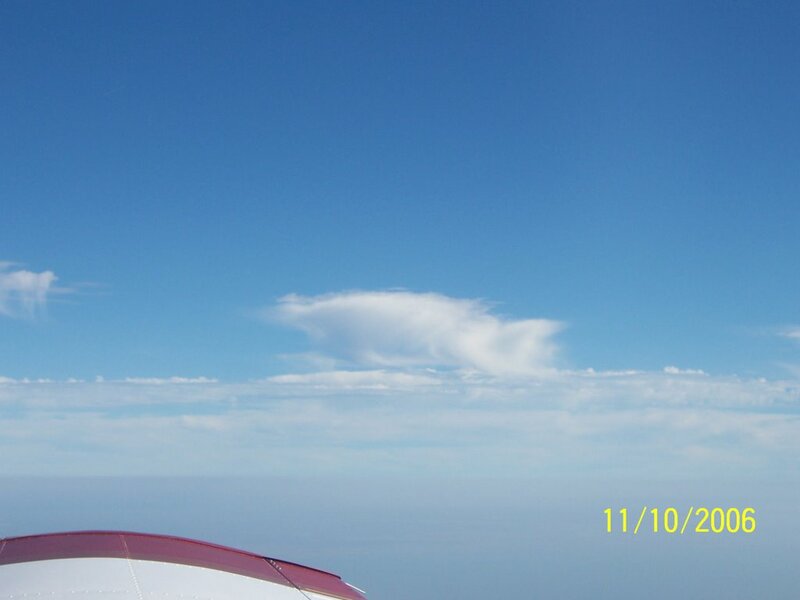 We are directed to enter the right downwind 14 and report abeam the numbers. I read back the right downwind but I didn't hear all of the "abeam the numbers". Tower repeats and I confirm. Looking good if we were on final for r/w 1 but we're not so a left turn to a heading of 320 and I am on downwind. As I am about to call the tower I am cleared to land and hold short of 1. They have a Mig landing on r/w 19 just after I land on 14. 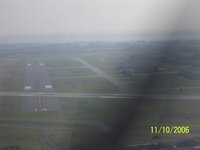 I touchdown smooth and roll out to a stop well before runway 1 and get instructions to turn off on t/w F. With the after landing checks complete I contact ground for taxi to parking instructions. An easy trip with right turn on F, hold short runway 9, cleared to then turn right on r/w 9 and a left turn on K5 and we are home! With 28679er safe and secure we wheel our bags to the SUV. Hmmm...it's a bit of a search and rescue as we look for the keys. We finally locate our keys and vow to work out the kinks in the process for the next trip. 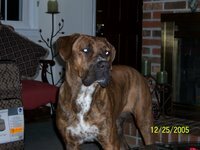 Time to head home then back out to pick up the Maggie girl so all the family is back together. Yep, planning for our first overnighter. Mary and I have decided to visit our friend Susan in Williamsburg, VA. I confirmed our hotel reservation at the Hampton Inn, booked the car that will be at the airport waiting and cleared the insurance qualifications in the club aircraft by faxing in my log book copies to show the 5+ hours dual in type. Now on to the fun stuff! 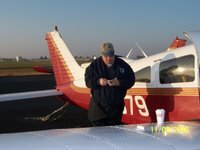 I worked up a flight plan on the AOPA planner, plugged in my aircraft info and completed a weight and balance on a excel spreadsheet. Mary and I will be posting our trip journal after our return home. Here is the flight plan as of today. 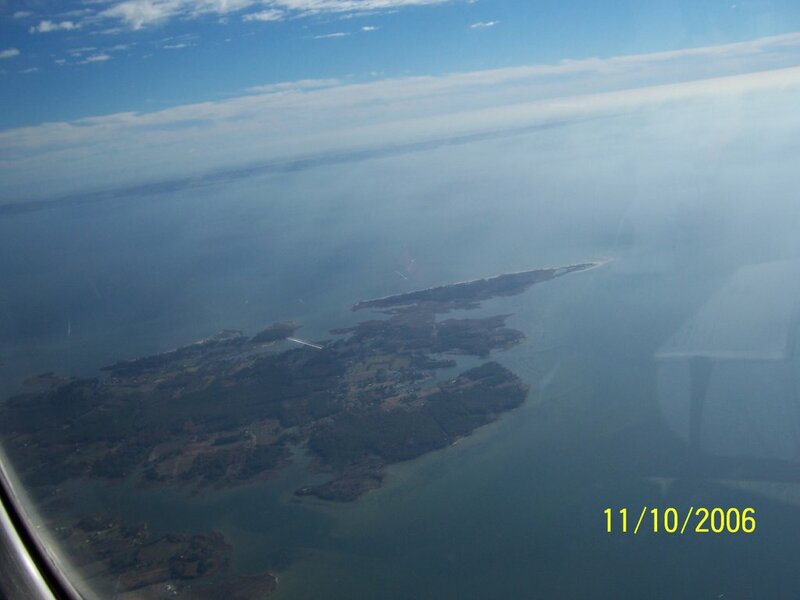 I decided to steer well clear of the ADIZ and instead fly along the Maryland/Virgina coast of the Chesapeake Bay. I have run both routes and there is no real time saved. We will take a peek at Tangier Island (KTGI) another place we want to visit located in the Bay north west of Accomack(KMFV) and look for the campers at CheeryStone, where some of our friends rent cabins and spend time fishing. A lot of sight seeing and I hope some great photo's. WX is looking very good for both Friday and Saturday. An early start today as I prepared for my initial flight in 28679. I arrived at the airport by 6:30 and completed my pre flight with the exception of sumping the fuel. I ordered fuel and always sump afterwards. Six seven niner took 25 gallons and upon my test found no water. Clear prop! was the call and 679 comes to life. I tuned in KESN on the Garmin 300 and gezzz do I need to read that book again. I pass on playing with the radio portion and opt for com 2. Atis dialed in and information Bravo noted, we are ready for our taxi out. Our taxi instructions take me to r/w 27 via t/w "k" with a departure from intersection at t/w "m". I bee bop on by a gulfstream (Campbell Soups aircraft) and turn on to kilo. 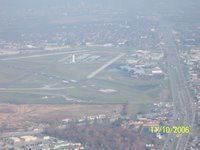 I proceed with my run up and when complete confirm runway 27 intersection at "m" departure with ground, ground confirm's. Ok flip to the tower and I am cleared for takeoff to remain in pattern for T&G's right traffic 27. Four rounds on 27 and then I am directed to enter left downwind for r/w 32, I confirm and turn out to the left and position as required. This tower stuff is a blast, I love the whole radio thing. One round on 32 then directed to enter right downwind for 27 again. I confirm and on departure turn right to enter the right downwind for 27. I needed to make adjustments for the winds today blowing in on 27, but it was good practice for locating ground reference points. Ok final T&G complete my CFI announces our departure to the SW to Easton, MD. Time to get familiar with the GPS and autopilot. 679 was rock solid and very stable, she trimmed out very nice and held heading and altitude with little or no extra work. The auto pilot was cool, always love new toys but I must admit I rather hand fly anyday, it just felt strange. Switching over to ESN traffic I announce my position and intentions. Traffic seemed light and I could have opted for the straight in but I instead positioned for a right base entry to runway 22. That age old discussion how to enter.....Straight in provided the best view of the pattern but I opted to have that extra look see and enter right base. A tad high but with a slight slip I am in holding off the nose much better this time around. Bill, my CFI always reminds me not to flare as high and hold it off as I sink. 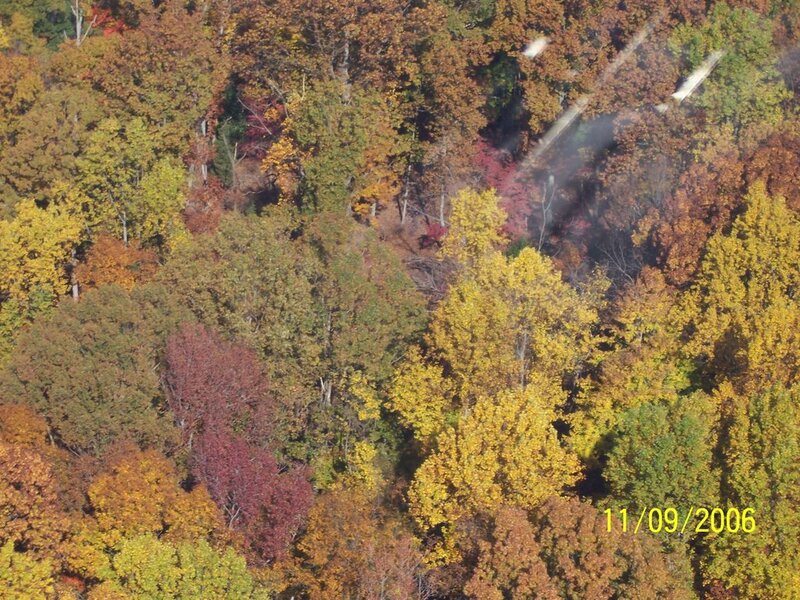 The Archer tends to feel nose heavy landing and he recommended once in flare add in trim to ease holding it off. A quick stretch of the legs and a bottle of water has us saddled back up and heading to Wilmington. 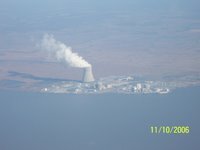 I call Wilmington tower about 15 out to the southwest and I am told to report 2 mile left base 32. As I get a bit closer the tower asked where I was going (red eagle) and offered runway 9. I stayed with 32 and eventually reported left base. cleared to land and adding a second notch of flaps I turn final. Bill reminded me almost every landing to get on center, I wanted to make the last one a good one. Pretty much on center but rolling out to my left and make correction and as instructed turn right on runway 9 followed by a left on taxiway K5. With 28679 back home and secured Bill and I talk about the aircraft, flying and my future instrument rating. Some of the things I need to do is order a checklist in the flip format. While the one in the aircraft works, it's way to busy for me. Bill shared some really good tips today and I'll add them to my list of knowledge for those occasions I may need that little bit extra. 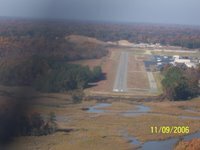 He also reminded me to stop in and see him at Brandywine, which I will do to take advantage of that 50' wide runway to help keep me "centered". 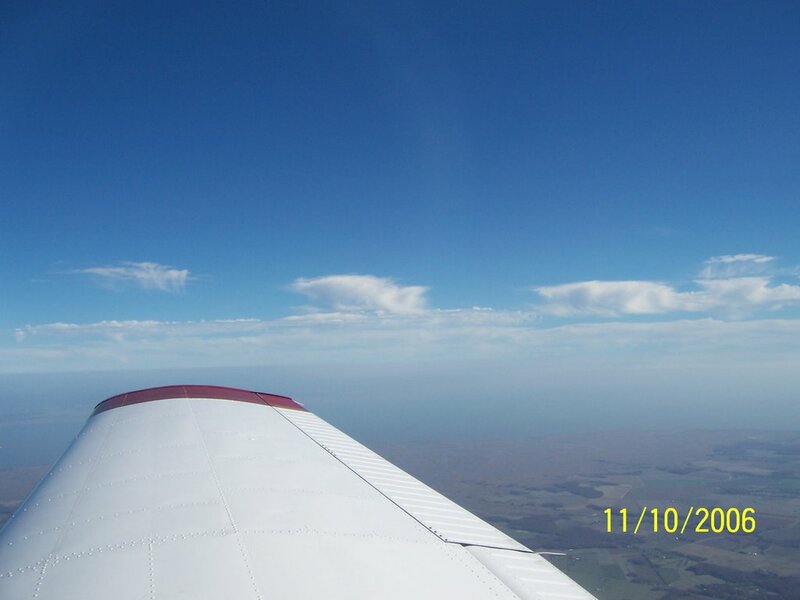 A nice day to fly, and always great time flying with Bill my CFI. I reminded him that we need to get together for a night out to dinner with the ladies and he agreed. 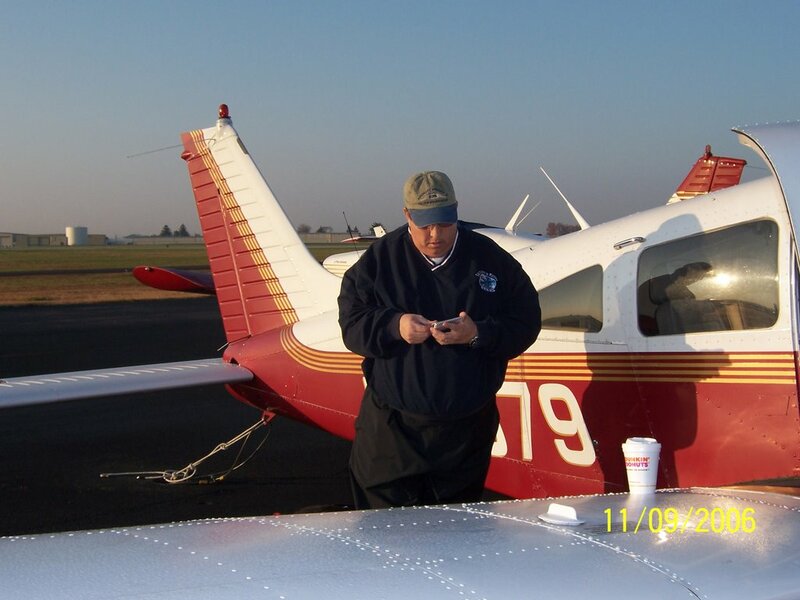 If there is one thing that I have treasured since learning to fly it's the friendships I have made. 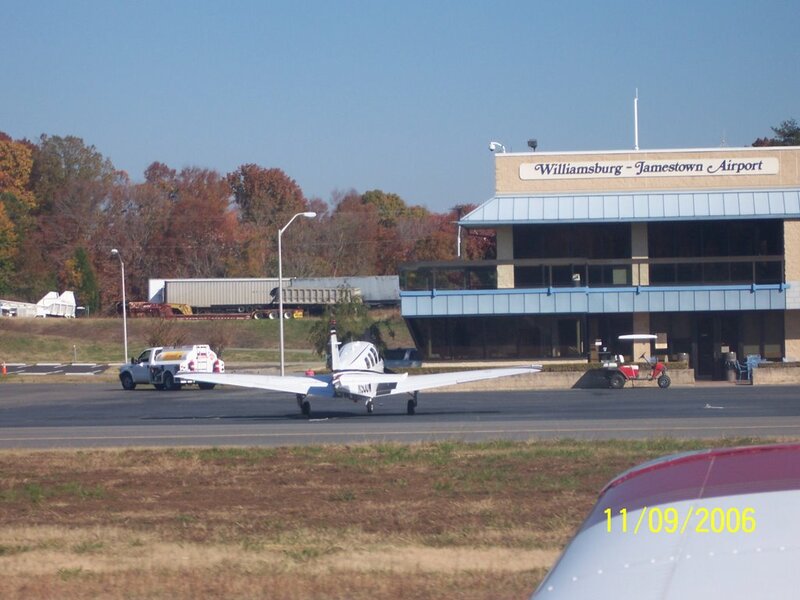 The Delaware flying Club just opened the door to more adventures and friendships for both Mary and I.